Christmas from a camel's-eye-view. 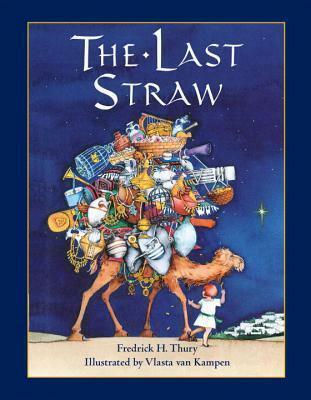 Everyone has heard the Christmas story before, but THE LAST STRAW is a unique and unforgettable new telling. Voices roll across the desert sands to Hoshmakaka, a curmudgeonly old camel, whispering that he has been chosen for the great responsibility of carrying gifts to the new baby king. With reluctance, Hoshmakaka accepts his task. Every day in the heat crossing the desert, his pack grows ever more burdensome as the crowds of people, anxious to welcome the new king, give him their gifts to carry. He is as strong as ten horses as he proudly tells the younger camels. But, oh, his gout! Oh, his sciatica! Nevertheless, Hoshmakaka plods on until he reaches Bethlehem. In the end he realizes the great honor of his task and never again is there a burden too heavy for him to carry. Vlasta van Kampen's gorgeous illustrations of the hot desert sands and the cool, star-filled night sky transport readers on the journey to Bethlehem to see the new baby king. The beautifully detailed illustrations of the loveable Hoshmakaka masterfully change as his pack of gifts grows impossibly huge. The endearing Hoshmakaka is also available as a plush toy to be a companion at storytime. Nine inches tall and adorned with his precious pack of gifts, Hoshmakaka will be a great reminder of the rewards of giving all year long! Fredrick Thury served as Artistic Director of York University's Vanier College Productions for over twenty-five years. He was originally commissioned to write the story for THE LAST STRAW by the Toronto Children's Chorus, which performed the piece with musical accompaniment and subsequently recorded it for the CBC. Mr. Thury's works for children's theater include One Potato Too, The Technicolour Wizard, and Behind the Wrinkles. Mr. Thury lived in Toronto. He passed away in 2006.